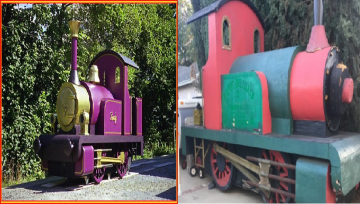 In December 2017, Restore The Magic acquired Lady, a large scale wooden train prop utilized in the 2000 feature film Thomas and the Magic Railroad. Following this, our organization refocused our mission from being a fan driven movement for an unreleased version of Thomas and the Magic Railroad to a 501(c)3 nonprofit organization educating the public about the vast history of railway representation in media. The planned interactive exhibit will feature over 100 years of props, costumes, first edition books, and more to tell a cohesive story and showcase how real life railways and engines have inspired some of the world's favorite stories and songs. Our dedicated Board of Directors has a wide range of experience in museum exhibits, theatrical tours, special events, and interactive programming that allows Restore The Magic to create a unique and beautifully crafted experience that all ages can enjoy. A full exhibit and further acquisitions is currently on hold until the restoration of the film prop (Lady) is completed. When film props are created, they are only made to last the length of the filming process and nothing more. This prop has sat outside in the California rain and heat for nearly 17 years. Because of this, the foundation of the prop is starting to bow inwards, making it unsafe and potentially dangerous. The chosen restoration company has an incredible team of people, some of whom originally worked on the film that Lady was featured in! With their techniques and skills, Lady will be restored to "better-than-film" condition, allowing generations of people to learn not only about this character and the film for decades to come, but also the very unique restoration process for this prop. At Restore The Magic, we want to make sure our materials are properly cared for. This means giving items as much attention as possible as they come into our collection to make sure only minor cosmetic work will need to be performed over the remainder of the item’s life. Due to this, upfront costs for items are significantly higher than anticipated. In order to complete the job properly, the repair and restoration will total approximately $30,000. As part of our mission to restore and preserve the history of railways in media, this campaign is the first in a long list of projects we are working on, and hope to support other similar nonprofits as soon as we can. The bid breakdown includes the reconfiguration of the prop's base foundation, utilizing the latest technology to recreate the missing or damaged parts of the prop, new finishing to allow the prop to glisten like never before, and the transportation costs to get the item to the company in Southern California and then to its next home in Orlando, Florida. Any assistance for this project is greatly appreciated. On behalf of the entire team here at Restore The Magic, we want to thank you for assisting us in our mission to the education of railways in media and to restore the magic to Thomas and the Magic Railroad. About Thomas and the Magic Railroad: Released in 2000, Thomas and the Magic Railroad stars Peter Fonda, Mara Wilson, and Alec Baldwin. The film was theatrically released to mixed-negative reviews and did not return on investment as predicted. Unfair blame and harsh criticism was placed on the movie’s director and writer, Britt Allcroft (creator of the Thomas and Friends television series), particularly targeting the story’s writing style and structure. Seven years later, it was discovered through several leaked scripts that there were huge edits made. These changes included character eliminations, plot points being abandoned, and the recasting of several voice actors prior to the movie being theatrically released. This was due to a very poor test audience screening in the United States. From there, producers and studio executives decided to make these major edits against the will of the creative team behind the motion picture. Over the last several years, fans have united to show their support in discovering the lost footage and restoring the magic to Thomas and the Magic Railroad.